Thought I'd share some screenshots I've taken since I've been here. This is my ponysona. The name is the result of entering my real name into one of those pony name generators. The first one I tried gave me the name "Brother Lionheart". Might have used it, but I checked and there was already around a half dozen other OC's with that name. The second one gave me this and I stuck with it. What I like is the cutie mark almost perfectly matches the one in the game (cloud and lightning bolt). Chrome's occupation is a signal maintainer for the railroad. Also a storm spotter (which I really am IRL), and a member of the NLR. A few years ago I made 2 fanfics that he was the lead character in (Ace Combat: Battle for Equestria and Ace Combat: The Changeling War), changing him from an earth pony to a pegasus and changing his cutie mark from an F-14 to a spade (wish playing card symbols were available as CM's in the game). Maverick is a weather pony and part of the Shadowbolts branch NLR Air Force. He did don a Wonderbolts costume for one event. An OC I based off the Nightshade flower. She was another character in my 2 fanfics (in the 1st an antagonist, the 2nd a protagonist). A tough as nails mare that hates wearing dresses, and loves doing stunt flying (including making low, high speed passes by other ponies). Also a member of the Shadowbolts. In 2009 I started making a series of G1 and G3 customs based on Ace Attorney characters, including my favorite villain from the series. She became a main character in my Ace Combat: BFE fanfic too. Unlike the character she's based on she's not evil, and is yet another Shadowbolt. Nothing special just a pony based off of the lead singer of a band I became a fan of last year (I wish the skeleton costume worked on him correctly, and I wish a pontiff hat was available in the game). A unicorn that is fascinated by paranormal stuff, exploration, and is one of the few non pegasus weather ponies. He was based on the G1 Mountain Boy (a series of big brother brushables only released in the UK). Had to delete him as he was stuck as a foal due to a glitch in the final mission. She is a canon FiM character that appeared as one of the Method Mares in Made in Manehattan. Originally a no name, she got the name Raspberry Beret as part of a fanbase naming contest on I think Reddit or somewhere. The season 8 episode Horse Play made her name canon. 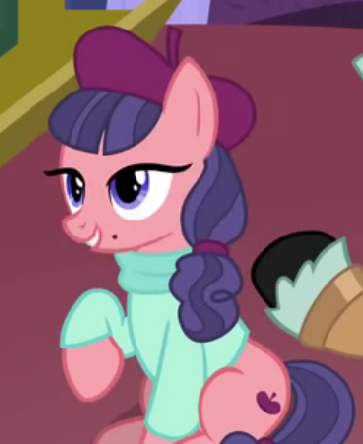 A mare who's well versed in art and theatrical events (she needs a beret and a turtleneck in the game). Have lots more, but wanted to post these first (and I don't have time right now ). Ok time for some more. There I'm caught up. Will post more if something interesting comes up. 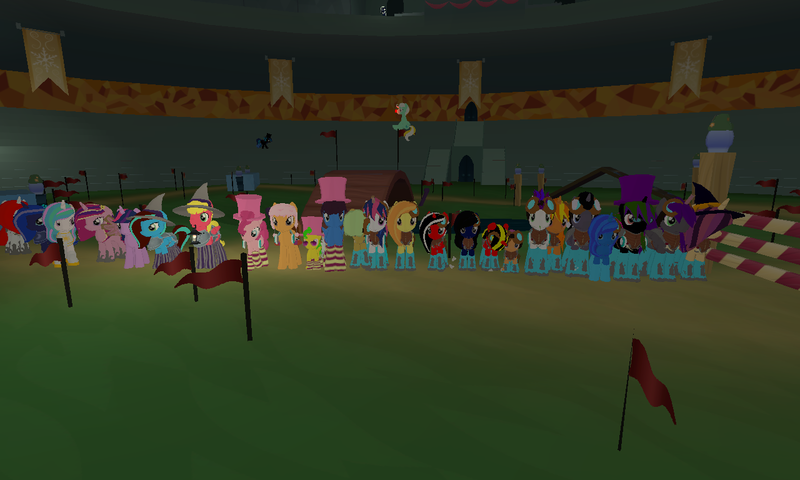 Edit: 3-6-18: Had another event happen in the dragon corner of the Everfree yesterday. 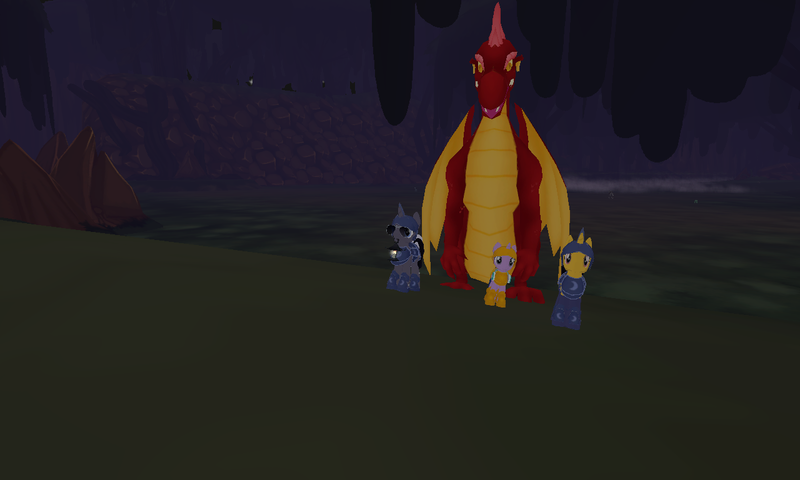 Me and a few others were grinding exp from dragons and timberwolves (well they were. 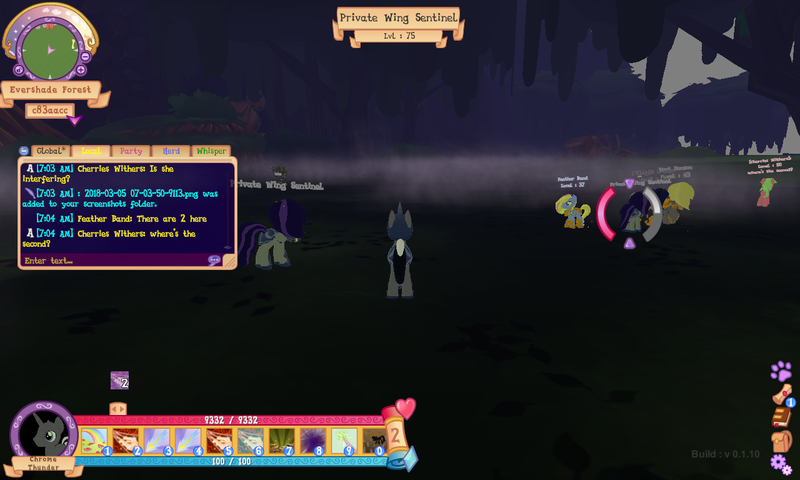 My main character is finally maxed out), when suddenly NPC Private Wing Sentinel appeared, and started interfering with us by killing any wolves that got near her, and she wound up in the middle of some of our attacks, and she started coming after us. Namely me even though I wasn't attacking her. She managed to kill me twice, then a second one of her showed up. The others managed to take them out and they didn't reappear. Dahlia had no problem with the new gown though. Here's her and several others checking out Micro Transaction's booth. She got the princess special too. Finally yesterday Chrome decided to run the Bramble gauntlet alone. Here he is looking over the valley of doom. Will he make it? The first try he failed. On the 2nd he succeeded, and managed to kill the Haetea. Purchasing AllState insurance coverage for fire, theft and damage is much more economical than hiring security guards... and a lot more effective! Oh wow Chrome. I didn't know you were so well travelled. Let me just say you're an awesome pony! Keep up the good work. Thanks.I'm never one to miss a good photo op. So then he wondered: What is beyond the brambles? Desolate terrain. But wait what is that in the distance? The edge of the world (or at least the bramble area). He proceeded to run to all 4 corners of the world, circling the brambles. The only things of interest was this bluff, and a pit that seemed to be inescapable. One last overview of the brambles before passing through the barrier again. More recently he popped in to SCC and discovered a virus that turns ponies into was going around. Needless to say he didn't hang around. She took out enough of them to jump a full level in combat. Papa heard it was possible for unicorns to reach the Everfree cauldron, so he decided to see for himself. He then proceeded to explore the rest of the area, but could only see half due to the gorge. So he went home and had Maverick see what else was there. Mav' didn't find much other than a good view of the gorge by the dragon den. He finally returned to town. Chrome went to the Crystal Arena for a New Lunar Republic race event Saturday morning, but only him and Night Striker showed up. Maybe next time. Unbeknownst to Papa and Rose, the princess of shipping (Cadance) was hiding nearby waiting to strike with her crossbow. Sadly due to a prior commitment, Maverick won't be able to join the air show/Gala. Same story with Chrome, Papa, Dahlia, Nightshade, and Raspberry. Time for some more pic's. Took a lot of good ones of events, places, etc., but there's too many to post, so I'll try and cover them. First I had an idea floating around: Since Papa is supposed to be in a band (Ghost), I thought of holding a concert somewhere. What would happen is i'd post a link to the song in chat for people to listen to, then i'd do my best to keep up with the lyrics. Any thoughts? Nightshade spotted a pony at SCC that reminded her of a character from an 80's cartoon. Hey what happened to the library interior? Nightmare Moon? It's Shadowbolt time! Watch out Celestia! The mane main 6 had to spoil NMM's fun though. It's been awhile. So much has happened since the last time. Dahlia chilling in Canterlot at a doughnut giveaway. Ready for more acting lessons? Finally the secret cave. Will he make it through the 2nd barrier? Even Ellowee appeared for it. He turned and boops were exchanged. 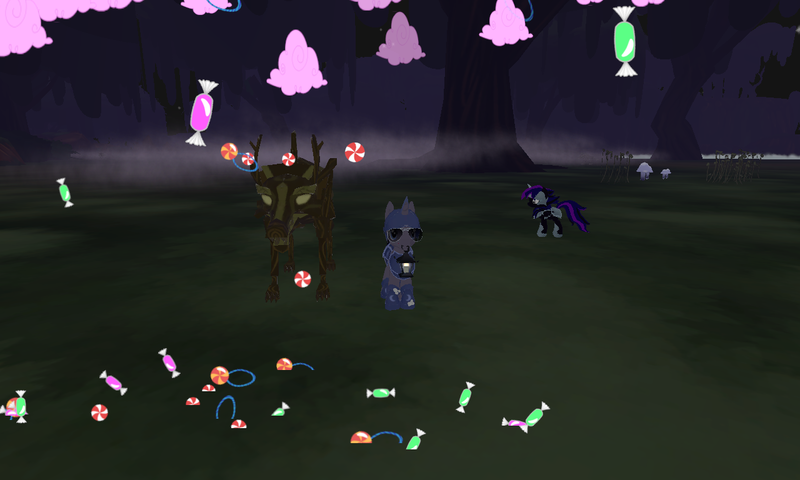 With the threat of attack on the Equestria Games, and because of the enemies hanging out around the paths in the Heartlands, Nightshade and other ponies offered security for the first events. The events had to be called off though after the dragons conspired with the Dryads to disrupt the time space continuum and caused time to slow down. That's it til' next time! His victory was short lived though as the race had to be rerun due to confusion about 3rd place. Having the win ripped out from under him was on his mind in the 2nd race, and he made some mistakes. He might have got 2nd place, but he landed on the rim of the finish platform, and the momentum forced him off it and by the time he got back up it was too late to even get 3rd. The airshow went good, though again he made a couple of mistakes. Luckily Cloudsdale still won. The next day Chrome got 2nd in the CE unicorn obstacle race, and Raspberry 2nd in the earth pony one. Will have some more after I get off work. Nightshade made it to level 50, followed shortly by Maverick, but their status will be short lived. And why is it always cute when a pony hides like that? Raspberry preparing for the earth part of the relay race. After discussion though it was decided instead Chrome would do the teleport part. The final race. Maverick decided to give it 1 more try. He didn't fare much better, coming in 4th, but he was happy to see his team get a win over their arch rival. The awards. 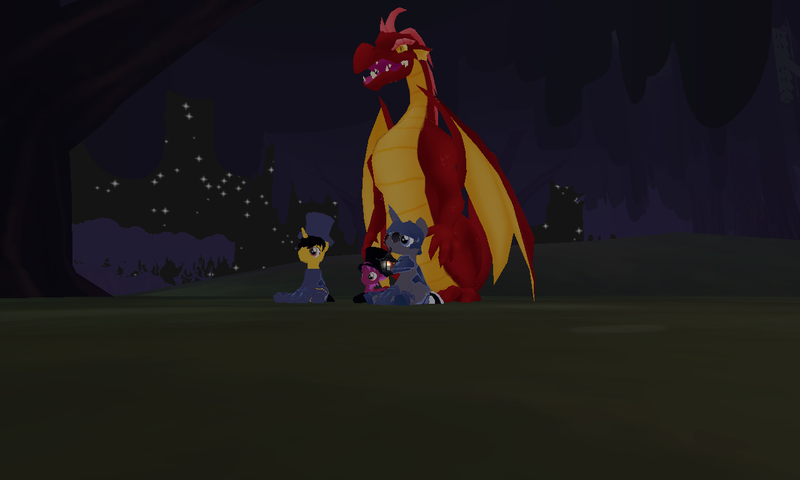 Followed by the dragon's getting revenge on Equestria. It's been too long. Time for some more. She then proceeded to explore the new places, however her and the others had a problem: They were stuck with the armor they had on until they hit level 30. Removing it meant the inability to fight. One idea she helped improve was the large number 1 made out of candy clouds. She became the guide for the other ponies, and the tip of the 1. The airshow went great, then afterwards Ellowee accidentally nuked everyone with a dragon. And as of now, the curse on my characters has been lifted, and they can freely change outfits now (AKA lv 30). Phew that was probably the largest post yet. Until next time! Time for some more. First off though I'm RP'ing with another character, and we want to have a 2nd foal, but haven't found someone else to RP' it. It would be a filly unicorn. The RP happens maybe once or twice a week between 7PM and 12AM central US time. Would anyone be interested? Anyway on with the photos! Any certain reason you're up here? Nightshade wants to know what's going on in that house. Maverick and the flight team training for the airshow held for Sunny Skies birthday.